Welcome to Live a Colorful Life. 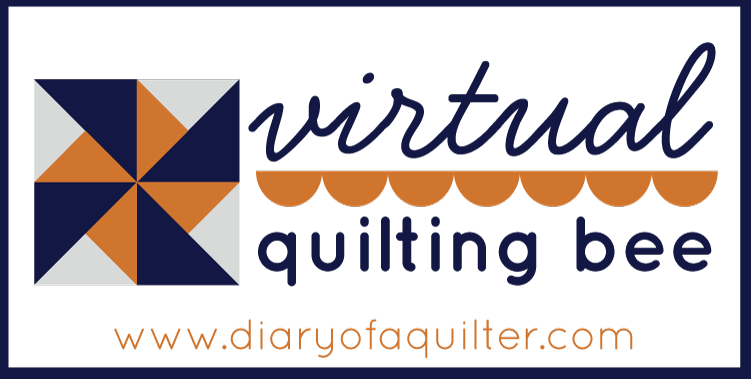 I'm so happy to have you here as the next stop on Amy's Virtual Quilting Bee. Just a little bit about me. I have been quilting for about twenty years. I have been married for lots of years to my husband, whom I met in college. He totally supports this passion of quilting and helped me turn our never-used living room into a great sewing room. I love sewing with solids and selvages. I drink too much coffee and love rainy days, which are few and far between here in the central valley of California. 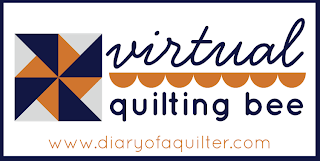 If you are new to the Virtual Quilting Bee you can see the previous fifteen blocks and get more general info about the Virtual Quilting Bee and how you can participate here. Today we are going to make a block named Chiral Music. Quickly, here is the back story on how it got such a quirky name. As you can see, it is kind of a mirror image type of block. After I finished making it the other night, I sent a picture over to our son and daughter-in-law, wondering if they could come up with a snappy name, better than in-out, hello-goodbye, etc. Almost immediately Aaron texted me back with "chiral music." I texted back, "did you mean 'choral'?" Nope. "Chiral" refers to a molecule that appears to be a mirror image but actually is not exactly superimposable. Got that? And "music" is kind of a play on word on the word I thought he meant, choral. I liked the name. So let me show you how easy this block is to construct. Cut all the 3" squares in half diagonally to make half square triangles (I like to oversize them just a bit, so I can trim them for accuracy). 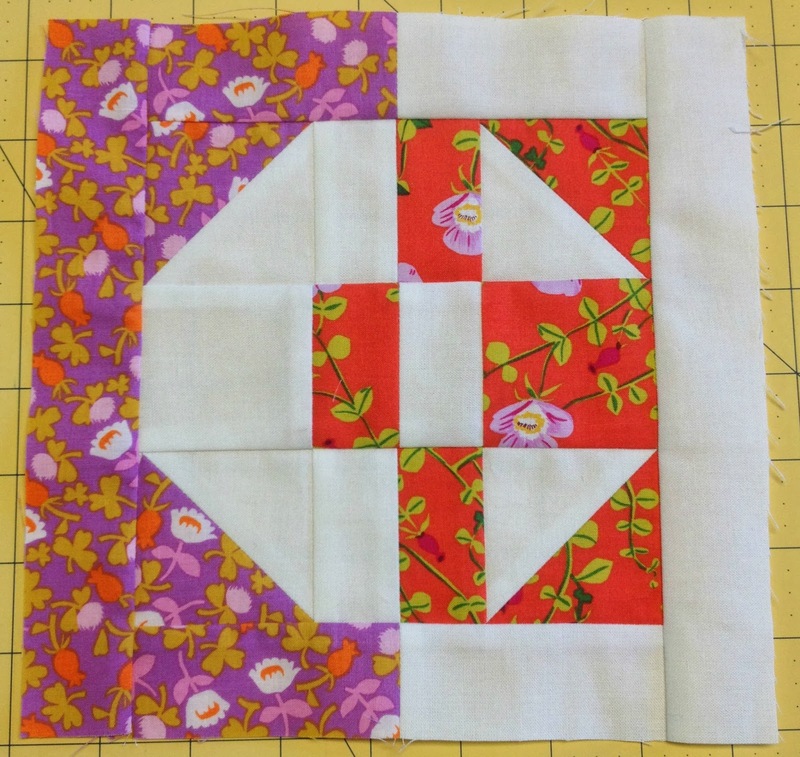 Pair the two triangles from Fabric A and Fabric B each with a triangle from Fabric C. Sew. Press open.Trim each to 2 1/2". Sew the three 1 1/2" x 2 1/2" rectangles from Fabric A and Fabric C together along the long side. Press open. 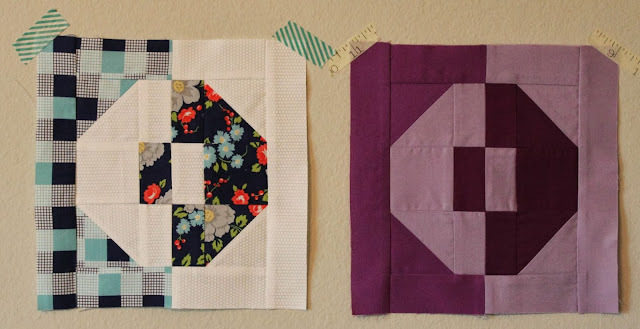 Sew the two 1 1/2" x 3 1/2" rectangles from Fabric B and Fabric C together along the short side. Press open. I pressed away from the nine-patch rows. Then you are ready to add the side segments, and press toward the side segments. I hope you enjoyed making this block. It looks so different in solid and print. Do you have a preference? And the next time you and your friends are talking about molecules (because that happens all the time, right? ), you can impress them by mentioning the asymmetrical chiral molecule. Thanks for stopping by this week. I hope you will come back and stay awhile! 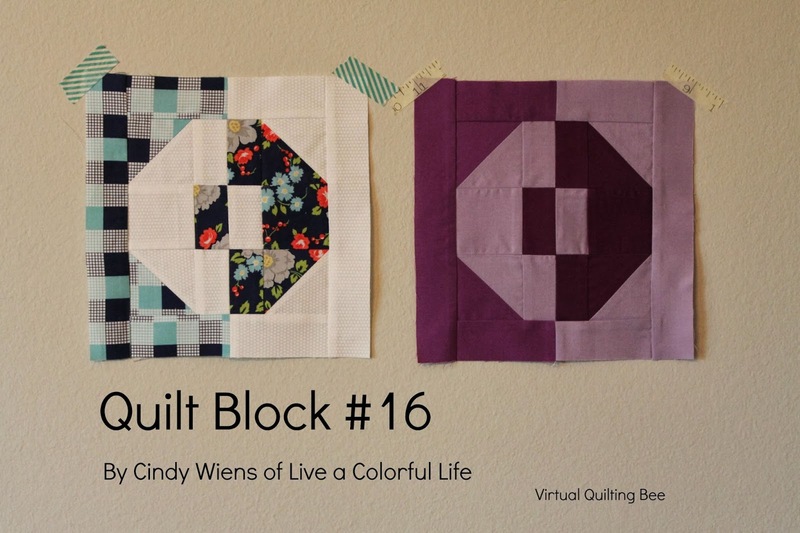 Be sure to add your block to the Virtual Quilting Bee Flickr Group. 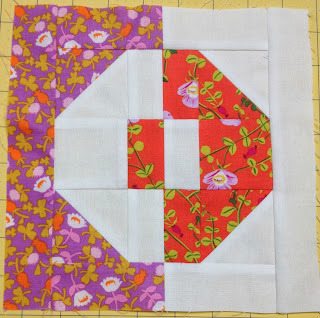 And because this is the final block tutorial for the Virtual Quilting Bee, I think that qualifies as a Friday Finish, so I'm linking up with crazymomquilts. When I read your post I really had to smile! Although I still have to figure out what exactly a quilting bee is (you Americans have the funniest things! I now keep thinking about a nice little bee with glasses, madly stabbing at a quilt with her sting) the combination with chirality reminded my of something I heard a while ago: Bees are chirally aware! With sugars being one of the most prominent examples of chirals in chemistry I find it is fun to know that bees, presented with both kinds of chirals of a sugar (called "hands", because hands are also chiral), will only gather one of the chirals but not the other. Your name for the block is absolutely brilliant, chapeau to your son! Also I must say, I do love your "wrong" sample block. Wouldn't t be fun to have one like it in a quilt full of "correct" ones? Love this one!! Can't wait to sew it together!! love the block, Cindy! I like the "wrong" one as well! Thanks for the tutorial! That is a great looking block and I got educated as well today. We are getting ready to enjoy a fall, rainy weekend. just a question on one of the measurements....did you mean (3) 1.5"X 2.5" for the light fabric? your pattern says (3) 1.5" X 3.5"
Yes. Thank you so much for pointing that out! It's corrected. 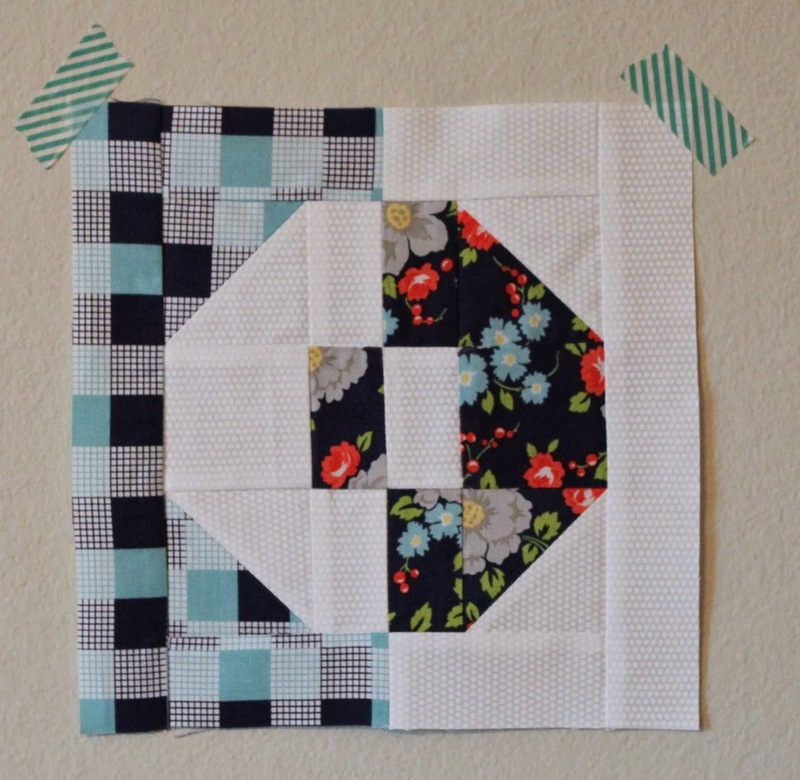 so cute, I love this- great tutorial! Great post, great block and great comment from Anna! I learnt so much just from this post! WOW...that is a fantastic block! Go Aaron!! I think I like the solids best. LOVE the florals and the plaid!! Great block Cindy. I love the mirror image concept. The "wrong" block looks like a "C" to me, so would fit right in with a quilt full of "right" blocks. Great tutorial and block, Cindy! Just starting ... will try to catch up and be ready for your next post. Great Block! I actually didn't come as part of the Virtual Bee, tho. I came to thank you for visiting my blog! I am making note of the bee and will check out the other links and tutorials as I am able to today! 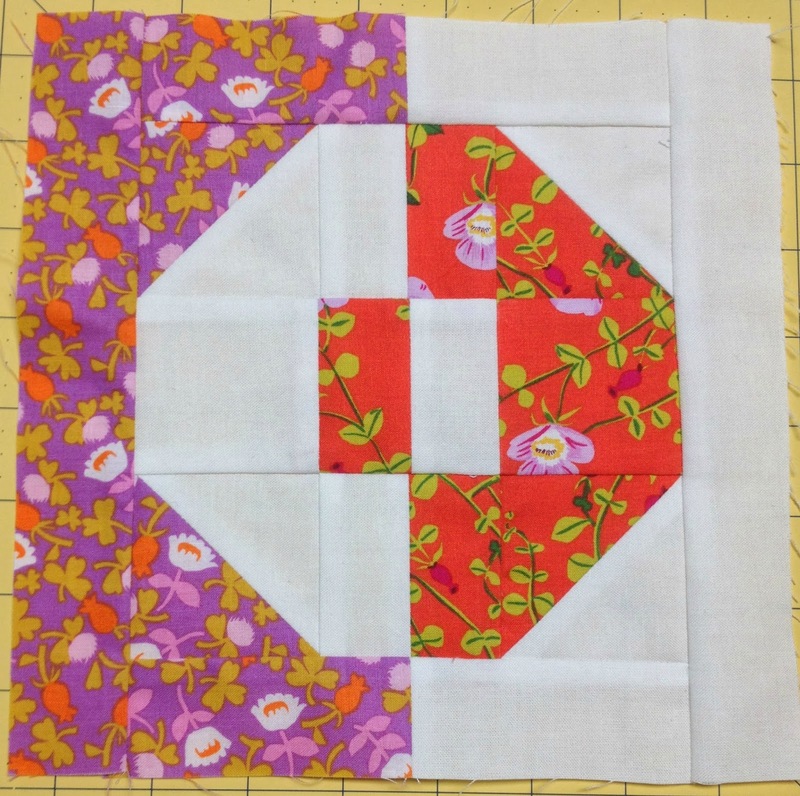 Goodness the name is way too complicated for me, but the block looks lovely! Cool block! It's really different, which is usually what you say when you don't like it, but you're trying to be polite, but I love how different it is. I may have to bookmark this one for a future quilt. I think it would be really cool to do a whole quilt in these using solids and trying for a gradient effect. Great block Cindy. Thanks for the tutorial. Did you mean sew Fabric A & C together for "Sew the three 1 1/2" x 2 1/2" rectangles from Fabric A and Fabric B together along the long side."? Joy, yes, thank you for the correction. I have changed the instructions. Great block Cindy. I hadn't heard of that scientific term before, and doubt a conversation about molecules will ever come up! Ugh, taking me back to high school chemistry.NOT my favourite subject.